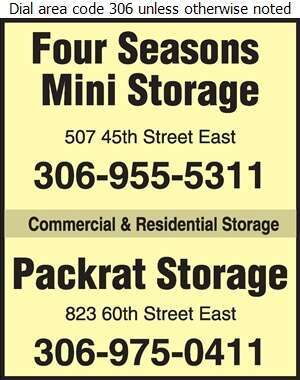 Four Seasons Mini Storage & Packrat Storage in Saskatoon are locally owned and operated. For your convenience, we provide 24 hour access to our storage units. Let us store your residential, commercial, business records and household storage items. We offer competitive rates and you have the option to rent monthly or yearly. Our storage facilities are unheated individual bays with sizes ranging from 5x10 feet up to 10x20 feet with 10 feet high ceiling units. Choose Four Seasons Mini Storage or Packrat Storage for all your storage needs!